For the theology of Martin Luther himself, see Theology of Martin Luther. 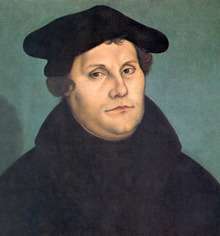 Lutheranism is a major branch of Protestant Christianity which identifies with the theology of Martin Luther (1483-1546), a German friar, ecclesiastical reformer and theologian. 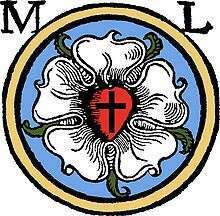 Today, Lutheranism is one of the largest denominations of Protestantism. 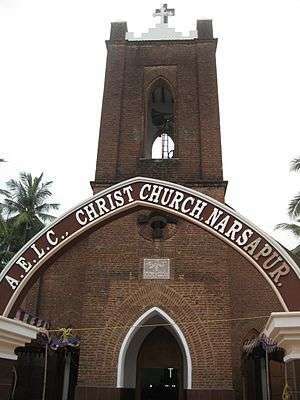 With approximately 80 million adherents, it constitutes the third most common Protestant denomination after historically Pentecostal denominations and Anglicanism. [lower-alpha 1] The Lutheran World Federation, the largest communion of Lutheran churches, represents over 72 million people. 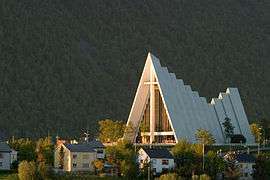 Other Lutheran organizations include the International Lutheran Council and the Confessional Evangelical Lutheran Conference, as well as independent churches. Since 1520, regular Lutheran services have been held in Copenhagen. Under the reign of Frederick I (1523–33), Denmark-Norway remained officially Catholic. Although Frederick initially pledged to persecute Lutherans, he soon adopted a policy of protecting Lutheran preachers and reformers, the most significant being Hans Tausen. Protestant beliefs about salvation vary. This table summarizes the classical views of three Protestant beliefs about salvation. Today, millions belong to Lutheran churches, which are present on all populated continents. The Lutheran World Federation estimates the total membership of its churches at approximately 72.3 million. This figure undercounts Lutherans worldwide as not all Lutheran churches belong to this organization. In recent years, Lutheranism saw a slight increase in its fellowship, which continues to the present. Lutheran churches in North America, Europe, Latin America and the Caribbean regions are experiencing decreases and no growth in membership, while those in Africa and Asia continue to grow. 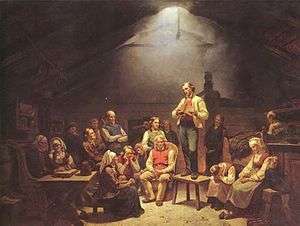 Lutheranism is the largest religious group in Denmark, the Faroe Islands, Greenland, Iceland, Norway, Sweden, Finland, Latvia, Namibia, and North Dakota. Lutheranism is also the dominant form of Christianity in the White Mountain and San Carlos Apache nations. In addition, Lutheranism is a main Protestant denomination in Germany (behind United Protestant churches; Protestants form about 31.7% of the country's total population), Estonia, Poland, Austria, Slovakia, Slovenia, Croatia, Serbia, Kazakhstan, Tajikistan, Papua New Guinea, North Sumatra, and Tanzania. ↑ MSN Encarta, s.v. "Lutheranism" by George Wolfgang Forell; Christian Cyclopedia , s.v. 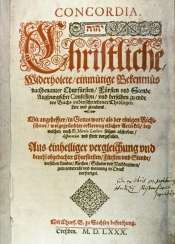 "Reformation, Lutheran" by Lueker, E. et. al. Archived 31 October 2009. 1 2 3 Fahlbusch, Erwin, and Bromiley, Geoffrey William, The Encyclopedia of Christianity, Volume 3. Grand Rapids, Michigan: Eerdmans, 2003. p.362. ↑ "Pewforum: Christianity (2010)" (PDF). Retrieved 2014-05-14. ↑ "Member Churches - The Lutheran World Federation". Retrieved 5 March 2015. 1 2 Espín, Orlando O. and Nickoloff, James B. An introductory dictionary of theology and religious studies. Collegeville, Minnesota: Liturgical Press, p. 796. ↑ "Bethany Lutheran Ministries - Home". Bethany Lutheran Ministries. Retrieved 5 March 2015. ↑ "Martin Luther Biography". Retrieved 5 March 2015. 1 2 3 4 5 Historisk fremstilling af reformationens indførelse i Danmark. Retrieved 5 March 2015. 1 2 3 Chapter 12: The Reformation In Germany And Scandinavia, Renaissance and Reformation by William Gilbert. ↑ Historisk fremstilling af reformationens indførelse i Danmark. Kjobenhavn. 1836. p. 195. Retrieved 5 March 2015. ↑ J. L. Rohmann (1836). Historisk fremstilling af reformationens indførelse i Danmark. Kjobenhavn. p. 202. Retrieved 5 March 2015. ↑ Historisk fremstilling af reformationens indførelse i Danmark. Retrieved 5 March 2015. ↑ "Danmarks og Norges Kirke-Ritual (Kirkeritualet) (* 1) - retsinformation.dk". Retrieved 5 March 2015. ↑ A Dictionary Of The Bible. Retrieved 5 March 2015. ↑ "Compendium of the Catechism of the Catholic Church". Retrieved 5 March 2015. ↑ "Untitled Document". Retrieved 5 March 2015. 1 2 Gritsch, Eric W. A History of Lutheranism. Minneapolis: Fortress Press, 2002. p. 180. 1 2 Latourette, Kenneth Scott. Christianity in a Revolutionary Age, Volume II, The Nineteenth Century in Europe. Westport, Connecticut: Greenwood Press. p. 165. 1 2 3 Gritsch, Eric W. A History of Lutheranism. Minneapolis: Fortress Press, 2002. p. 183. ↑ Benton, William, ed. (1974). "Lutheran Churches". Encyclopædia Britannica. 11 (15 ed.). Chicago: Encyclopædia Britannica, Inc. p. 198. ISBN 0-85229-290-2. 1 2 3 4 Gritsch, Eric W. A History of Lutheranism. Minneapolis: Fortress Press, 2002. p. 184. 1 2 3 Latourette, Kenneth Scott. Christianity in a Revolutionary Age, Volume II, The Nineteenth Century in Europe. Westport, Connecticut: Greenwood Press, 1959, p.21. 1 2 Latourette, Kenneth Scott. Christianity in a Revolutionary Age, Volume II, The Nineteenth Century in Europe. Westport, Connecticut: Greenwood Press. p.22. 1 2 Nichols, James Hastings. History of Christianity 1650–1950: Secularization of the West. New York, Ronald Press, 1956, p. 175. ↑ For the traditional Lutheran view of the Bible, see Graebner, Augustus Lawrence (1910). Outlines Of Doctrinal Theology. Saint Louis, MO: Concordia Publishing House. pp. 3ff. ISBN 0-524-04891-6. Archived from the original on 12 July 2006. . For an overview of the doctrine of verbal inspiration in Lutheranism, see Inspiration, Doctrine of in the Christian Cyclopedia. ↑ Graebner, Augustus Lawrence (1910). Outlines Of Doctrinal Theology. Saint Louis, MO: Concordia Publishing House. pp. 7ff. ISBN 0-524-04891-6. Archived from the original on 12 July 2006. , Engelder, Theodore E.W. (1934). Popular Symbolics: The Doctrines of the Churches of Christendom and Of Other Religious Bodies Examined in the Light of Scripture. Saint Louis, MO: Concordia Publishing House. p. 29. ↑ Benton, William, ed. (1978). 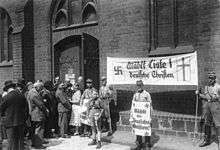 "Lutheran Churches". Encyclopædia Britannica. 11 (15 ed.). Chicago: Encyclopædia Britannica, Inc. pp. 197–198. ISBN 0-85229-290-2. ↑ 2 Timothy 3:16, 1 Corinthians 2:13, 1 Thessalonians 2:13, Romans 3:2, 2 Peter 1:21, 2 Samuel 23:2, Hebrews 1:1, John 10:35, John 16:13, John 17:17, Engelder, Theodore E.W. (1934). Popular Symbolics: The Doctrines of the Churches of Christendom and Of Other Religious Bodies Examined in the Light of Scripture. Saint Louis, MO: Concordia Publishing House. p. 26. ↑ "The Solid Declaration of the Formula of Concord". Retrieved 5 March 2015. 1 2 3 Engelder, Theodore E.W. (1934). Popular Symbolics: The Doctrines of the Churches of Christendom and Of Other Religious Bodies Examined in the Light of Scripture. Saint Louis, MO: Concordia Publishing House. p. 27. ↑ Psalm 19:8, Psalm 119:105, Psalm 119:130, 2 Timothy 3:15, Deuteronomy 30:11, 2 Peter 1:19, Ephesians 3:3–4, John 8:31–32, 2 Corinthians 4:3–4, John 8:43–47, 2 Peter 3:15–16, Engelder, Theodore E.W. (1934). Popular Symbolics: The Doctrines of the Churches of Christendom and Of Other Religious Bodies Examined in the Light of Scripture. Saint Louis, MO: Concordia Publishing House. p. 29. , Graebner, Augustus Lawrence (1910). Outlines Of Doctrinal Theology. Saint Louis, MO: Concordia Publishing House. pp. 11–12. ISBN 0-524-04891-6. Archived from the original on 12 July 2006. ↑ Graebner, Augustus Lawrence (1910). Outlines Of Doctrinal Theology. Saint Louis, MO: Concordia Publishing House. p. 11. ISBN 0-524-04891-6. Archived from the original on 12 July 2006. , Engelder, Theodore E.W. (1934). Popular Symbolics: The Doctrines of the Churches of Christendom and Of Other Religious Bodies Examined in the Light of Scripture. Saint Louis, MO: Concordia Publishing House. p. 28. ↑ Graebner, Augustus Lawrence (1910). Outlines Of Doctrinal Theology. Saint Louis, MO: Concordia Publishing House. p. 11. ISBN 0-524-04891-6. Archived from the original on 12 July 2006. ↑ Engelder, Theodore E.W. (1934). Popular Symbolics: The Doctrines of the Churches of Christendom and Of Other Religious Bodies Examined in the Light of Scripture. Saint Louis, MO: Concordia Publishing House. p. 28. ↑ Romans 1:16, 1 Thessalonians 2:13, Graebner, Augustus Lawrence (1910). Outlines Of Doctrinal Theology. Saint Louis, MO: Concordia Publishing House. p. 11. ISBN 0-524-04891-6. Archived from the original on 12 July 2006. , Engelder, Theodore E.W. (1934). Popular Symbolics: The Doctrines of the Churches of Christendom and Of Other Religious Bodies Examined in the Light of Scripture. Saint Louis, MO: Concordia Publishing House. p. 27. ↑ Romans 1:16, 1 Thessalonians 1:5, Psalm 119:105, 2 Peter 1:19, 2 Timothy 1:16–17,Ephesians 3:3–4, Graebner, Augustus Lawrence (1910). Outlines Of Doctrinal Theology. Saint Louis, MO: Concordia Publishing House. pp. 11–12. ISBN 0-524-04891-6. Archived from the original on 12 July 2006. , Engelder, Theodore E.W. (1934). Popular Symbolics: The Doctrines of the Churches of Christendom and Of Other Religious Bodies Examined in the Light of Scripture. Saint Louis, MO: Concordia Publishing House. p. 28. ↑ John 6:63, Revelation 1:3, Ephesians 3:3–4, John 7:17, Graebner, Augustus Lawrence (1910). Outlines Of Doctrinal Theology. Saint Louis, MO: Concordia Publishing House. p. 12. ISBN 0-524-04891-6. Archived from the original on 12 July 2006. , Engelder, Theodore E.W. (1934). Popular Symbolics: The Doctrines of the Churches of Christendom and Of Other Religious Bodies Examined in the Light of Scripture. Saint Louis, MO: Concordia Publishing House. p. 28. ↑ "Smalcald Articles - Book of Concord". Retrieved 5 March 2015. ↑ 2 Timothy 3:15–17, John 5:39, John 17:20, Psalm 19:7–8, Engelder, Theodore E.W. (1934). Popular Symbolics: The Doctrines of the Churches of Christendom and Of Other Religious Bodies Examined in the Light of Scripture. Saint Louis, MO: Concordia Publishing House. p. 28. ↑ Isaiah 8:20, Luke 16:29–31, 2 Timothy 3:16–17, Graebner, Augustus Lawrence (1910). Outlines Of Doctrinal Theology. Saint Louis, MO: Concordia Publishing House. p. 13. ISBN 0-524-04891-6. , Engelder, Theodore E.W. (1934). Popular Symbolics: The Doctrines of the Churches of Christendom and Of Other Religious Bodies Examined in the Light of Scripture. Saint Louis, MO: Concordia Publishing House. p. 28. ↑ "Defense of the Augsburg Confession - Book of Concord". Retrieved 5 March 2015. ↑ "Augsburg Confession - Book of Concord". Retrieved 5 March 2015. 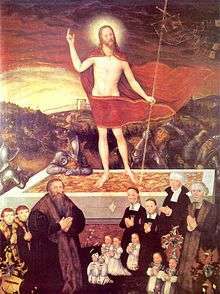 ↑ Luther's Small Catechism, The Apostles' Creed, Second Article, Graebner, Augustus Lawrence (1910). Outlines Of Doctrinal Theology. Saint Louis, MO: Concordia Publishing House. pp. 100ff. ISBN 0-524-04891-6. Archived from the original on 12 July 2006. ↑ Matthew 28:19, 1 Corinthians 11:23–25, Matthew 26:26–28, Mark 14:22–24, Luke 22:19–20, Graebner, Augustus Lawrence (1910). Outlines Of Doctrinal Theology. Saint Louis, MO: Concordia Publishing House. p. 161. ISBN 0-524-04891-6. ↑ Ephesians 5:27, John 3:5, John 3:23, 1 Corinthians 10:16, Graebner, Augustus Lawrence (1910). Outlines Of Doctrinal Theology. Saint Louis, MO: Concordia Publishing House. p. 161. ISBN 0-524-04891-6. ↑ Ephesians 5:26, 1 Corinthians 10:16, 1 Corinthians 11:24–25, Graebner, Augustus Lawrence (1910). Outlines Of Doctrinal Theology. Saint Louis, MO: Concordia Publishing House. p. 161. ISBN 0-524-04891-6. 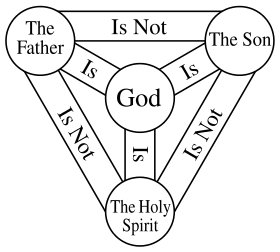 ↑ Matthew 3:16–17, John 3:5, 1 Corinthians 11:19, Graebner, Augustus Lawrence (1910). Outlines Of Doctrinal Theology. Saint Louis, MO: Concordia Publishing House. p. 161. ISBN 0-524-04891-6. ↑ Luke 7:30, Luke 22:19–20, Graebner, Augustus Lawrence (1910). Outlines Of Doctrinal Theology. Saint Louis, MO: Concordia Publishing House. p. 162. ISBN 0-524-04891-6. ↑ Acts 21:16, Acts 2:38, Luke 3:3, Ephesians 5:26, 1 Peter 3:21, Galatians 3:26–27, Matthew 26:28, Graebner, Augustus Lawrence (1910). Outlines Of Doctrinal Theology. Saint Louis, MO: Concordia Publishing House. p. 163. ISBN 0-524-04891-6. ↑ 1 Peter 3:21, Titus 3:5, Graebner, Augustus Lawrence (1910). Outlines Of Doctrinal Theology. Saint Louis, MO: Concordia Publishing House. p. 163. ISBN 0-524-04891-6. ↑ Titus 3:5, John 3:5, Graebner, Augustus Lawrence (1910). Outlines Of Doctrinal Theology. Saint Louis, MO: Concordia Publishing House. p. 163. ISBN 0-524-04891-6. ↑ "Baptism and Its Purpose". 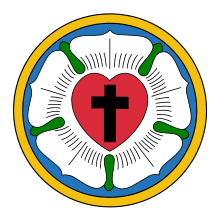 Lutheran Church–Missouri Synod. Retrieved 24 February 2009. ↑ Luther, Martin (2009) . 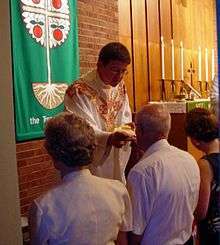 "The Sacrament of Holy Baptism". 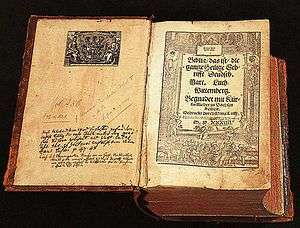 Luther's Small Catechism. ISBN 0-89279-043-1. Retrieved 24 February 2009. ↑ "The Small Catechism". Retrieved 5 March 2015. ↑ "Mat. 7:15-16; NIV - True and False Prophets - "Watch out - Bible Gateway". Bible Gateway. Retrieved 5 March 2015. ↑ "Joh 18:36; ESV - Jesus answered, "My kingdom is not of - Bible Gateway". Bible Gateway. Retrieved 5 March 2015. ↑ Matthew 25:41, Matthew 25:34, Matthew 25:46, Graebner, Augustus Lawrence (1910). Outlines Of Doctrinal Theology. Saint Louis, MO: Concordia Publishing House. pp. 233–8. ISBN 0-524-04891-6. 1 2 3 "Calvinism and Lutheranism Compared". WELS Topical Q&A. Wisconsin Evangelical Lutheran Synod. Archived from the original on 7 February 2009. Retrieved 26 January 2015. 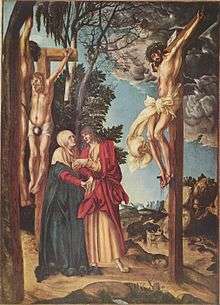 Both (Lutherans and Calvinists) agree on the devastating nature of the fall and that man by nature has no power to aid in his conversions...and that election to salvation is by grace. In Lutheranism the German term for election is Gnadenwahl, election by grace--there is no other kind. ↑ "Justification / Salvation". WELS Topical Q&A. Wisconsin Evangelical Lutheran Synod. Archived from the original on 27 September 2009. Retrieved 29 January 2015. Romans 3:23-24, 5:9, 18 are other passages that lead us to say that it is most appropriate and accurate to say that universal justification is a finished fact. God has forgiven the sins of the whole world whether people believe it or not. He has done more than "made forgiveness possible." All this is for the sake of the perfect substitutionary work of Jesus Christ. ↑ "IV. Justification by Grace through Faith". This We Believe. Wisconsin Evangelical Lutheran Synod. Retrieved 5 February 2015. We believe that God has justified all sinners, that is, he has declared them righteous for the sake of Christ. This is the central message of Scripture upon which the very existence of the church depends. It is a message relevant to people of all times and places, of all races and social levels, for "the result of one trespass was condemnation for all men" (Romans 5:18). All need forgiveness of sins before God, and Scripture proclaims that all have been justified, for "the result of one act of righteousness was justification that brings life for all men" (Romans 5:18). We believe that individuals receive this free gift of forgiveness not on the basis of their own works, but only through faith (Ephesians 2:8–9). ... On the other hand, although Jesus died for all, Scripture says that "whoever does not believe will be condemned" (Mark 16:16). Unbelievers forfeit the forgiveness won for them by Christ (John 8:24). ↑ Becker, Siegbert W. "Objective Justification" (PDF). Wisconsin Lutheran Seminary. p. 1. Retrieved 26 January 2015. ↑ "Universal Justification". WELS Topical Q&A. Wisconsin Evangelical Lutheran Synod. Archived from the original on 27 September 2009. Retrieved 5 February 2015. Christ paid for all our sins. God the Father has therefore forgiven them. But to benefit from this verdict we need to hear about it and trust in it. If I deposit money in the bank for you, to benefit from it you need to hear about it and use it. Christ has paid for your sins, but to benefit from it you need to hear about it and believe in it. We need to have faith but we should not think of faith as our contribution. It is a gift of God which the Holy Spirit works in us. ↑ Augsburg Confession, Article V, Of Justification. People "cannot be justified before God by their own strength, merits, or works, but are freely justified for Christ's sake, through faith, when they believe that they are received into favor, and that their sins are forgiven for Christ's sake. ..."
↑ Diehl, Walter A. "The Age of Accountability". Wisconsin Lutheran Seminary. Retrieved 10 February 2015. 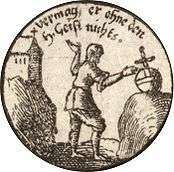 In full accord with Scripture the Lutheran Confessions teach monergism. "In this manner, too, the Holy Scriptures ascribe conversion, faith in Christ, regeneration, renewal and all the belongs to their efficacious beginning and completion, not to the human powers of the natural free will, neither entirely, nor half, nor in any, even the least or most inconsiderable part, but in solidum, that is, entirely, solely, to the divine working and the Holy Ghost" (Trigl. 891, F.C., Sol. Decl., II, 25). 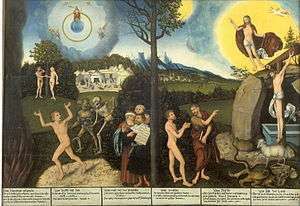 ↑ "Calvinism and Lutheranism Compared". WELS Topical Q&A. Wisconsin Evangelical Lutheran Synod. Archived from the original on 7 February 2009. Retrieved 9 February 2015. ↑ "Once saved always saved". WELS Topical Q&A. Wisconsin Evangelical Lutheran Synod. Archived from the original on 27 September 2009. Retrieved 7 February 2015. People can fall from faith. The Bible warns, "If you think you are standing firm, be careful that you don't fall" (! Corinthians 10:12). Some among the Galatians had believed for a while, but had fallen into soul-destroying error. Paul warned them, "You who are trying to be justified by law have been alienated from Christ; you have fallen away from grace" (Galatians 5:4). In his explanation of the parable of the sower, Jesus says, "Those on the rock are the ones who receive the word with joy when they hear it, but they have no root. They believe for a while, but in time of testing they fall away" (Luke 8:13). According to Jesus a person can believe for a while and then fall away. While they believed they possessed eternal salvation, but when they fell from faith they lost God's gracious gift. ↑ "Perseverence of the Saints (Once Saved Always Saved)". WELS Topical Q&A. Wisconsin Evangelical Lutheran Synod. Archived from the original on 27 September 2009. Retrieved 7 February 2015. We cannot contribute one speck to our salvation, but by our own arrogance or carelessness we can throw it away. Therefore, Scripture urges us repeatedly to fight the good fight of faith (Ephesians 6 and 2 Timothy 4 for example). My sins threaten and weaken my faith, but the Spirit through the gospel in word and sacraments strengthens and preserves my faith. That’s why Lutherans typically speak of God’s preservation of faith and not the perseverance of the saints. The key is not our perseverance but the Spirit’s preservation. 1 2 3 Piepkorn, A.C., Profiles in Belief: Volume II, Protestant Denominations. San Francisco: Harper and Row, 1978. P. 34. ↑ "Sweden Ends Designation of Lutheranism as Official Religion". Los Angeles Times. Retrieved 5 March 2015. General Council Historical Perspective: Krauth, Charles Porterfield (1875). 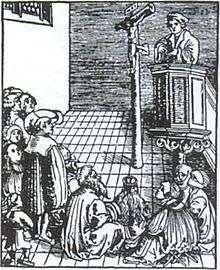 The Conservative Reformation and Its Theology: As Represented in the Augsburg Confession, and in the History and Theology of the Evangelical Lutheran Church (2nd ed.). Philadelphia: J. P. Lippincott. 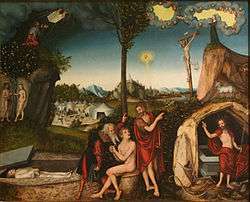 p. 840. ISBN 0-7586-0994-9. LCMS Perspective: Pieper, Franz (1950–1957). Christian Dogmatics. Saint Louis, MO: Concordia Publishing House. p. 3 Volumes. ISBN 0-570-06714-6. LCMS Perspective: Graebner, Augustus Lawrence (1910). Outlines Of Doctrinal Theology. Saint Louis, MO: Concordia Publishing House. p. 250. ISBN 0-524-04891-6. Archived from the original on 9 July 2006. Comparison of about 50 Lutheran church bodies in America: Brug, John F. (2009). WELS & Other Lutherans (2nd ed.). Northwestern Publishing House. ISBN 0-8100-0543-3. "Lutherans". Collier's New Encyclopedia. 1921.